EVINRUDE - FRONT. INCLUDED WITH ENGINE COVER ASSY. BRP LOGO - FRONT & REAR. INCLUDED WITH ENGINE COVER ASSY. EVINRUDE E-TEC - PORT. INCLUDED WITH ENGINE COVER ASSY. EVINRUDE E-TEC, PORT - H.O.. INCLUDED WITH ENGINE COVER ASSY. EVINRUDE E-TEC - STBD. INCLUDED WITH ENGINE COVER ASSY. 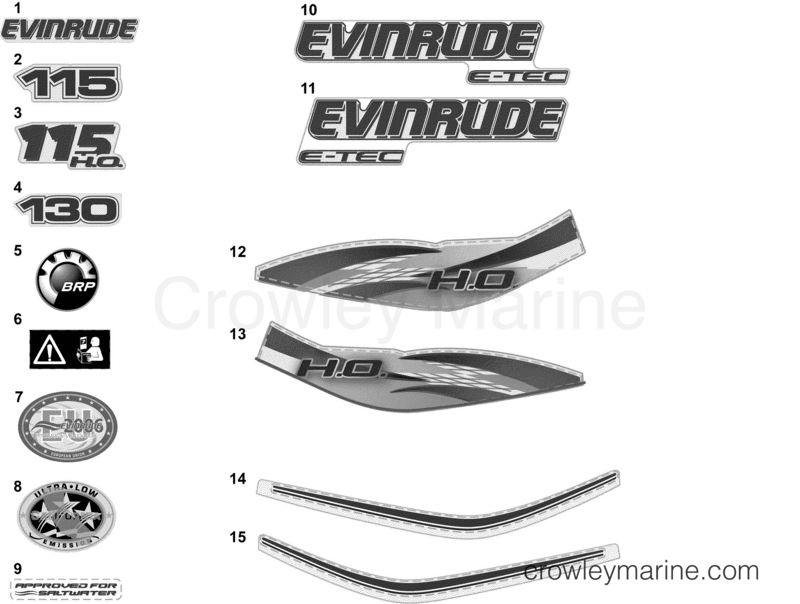 EVINRUDE E-TEC, STBD - H.O.. INCLUDED WITH ENGINE COVER ASSY. H.O. WAVE, PORT. INCLUDED WITH ENGINE COVER ASSY. H.O. WAVE, STBD. INCLUDED WITH ENGINE COVER ASSY. STRIPE - PORT. INCLUDED WITH ENGINE COVER ASSY. STRIPE - STBD. INCLUDED WITH ENGINE COVER ASSY.